In a large deep skillet, combine wine, water, lemon juice, rosemary and dried dill. Bring to a boil over high heat. Reduce heat; simmer uncovered 10 minutes. Add salmon; simmer gently until salmon is opaque and firm to the touch, 3 to 5 minutes. Meanwhile, heat a Dutch oven over medium-high heat. Add oil, then shallots. Cook 1 minute, stirring frequently. Reduce heat to medium. Add kale. Cover and cook until kale is wilted, about 3 minutes. Uncover; continue cooking kale, turning with tongs until tender, about 3 minutes. Add tomatoes, salt and pepper; heat through. Transfer vegetables to serving plates. 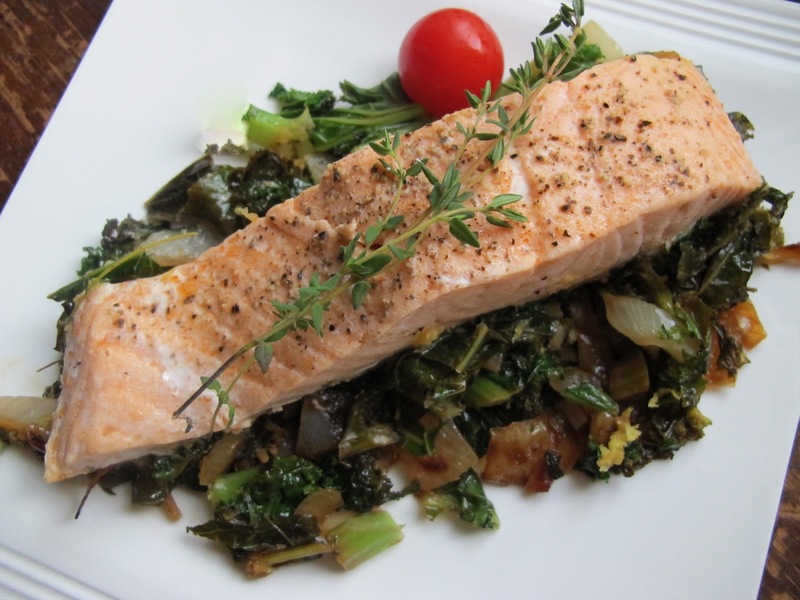 Using a slotted spatula, drain salmon; place over vegetables. Garnish with fresh dill and wedged lemon, if desired. A drizzle of olive oil or horseradish sour cream will add extra moisture to this dish, as will more chopped fresh dill—cooking the salmon gently is the best way to preserve moisture. Salmon steaks, cut through the bone, work well here too—you can leave the skin around the outside on, from start to finish. If you can find it, use lacinato or dinosaur kale—two names for the same kale!. Stemmed and washed, it has more delicate flavor and texture than most kale. Otherwise, whole leaf spinach can substitute for the kale. Broth can substitute for the wine, and your favorite other skinned fatty fish can substitute for the salmon if you do not fancy salmon.